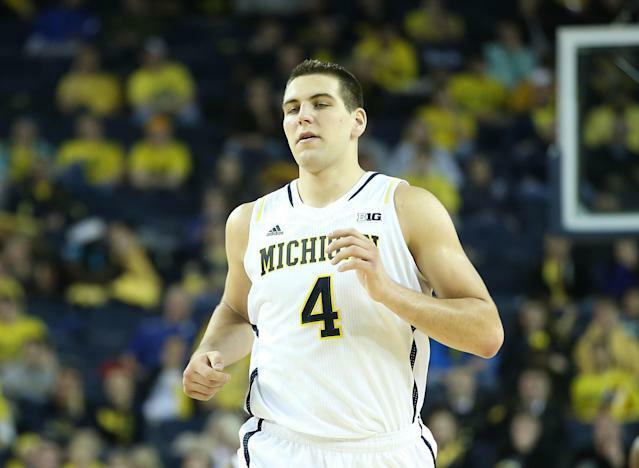 ANN ARBOR, Mich. – Mitch McGary took a deep breath. He wanted to tell the story of why he smoked marijuana one night in March, why the NCAA suspended him for a year because of it and why the confluence of those events is helping lead him to declare for June's NBA draft. It wasn't easy, so he started at the beginning. For months, McGary had struggled to come to terms with the back injury that limited him to just eight games for the University of Michigan this season, none after mid-December. Less than a year earlier, he helped lead the Wolverines to the 2013 national title game as a star freshman. Now, he was a spectator. One night in mid-March, with the NCAA tournament about to begin without him, McGary was hanging out with a group of friends at Michigan. He had a few drinks. Someone offered some marijuana – a common occurrence, he said, on campus. "I always turned it down," McGary told Yahoo Sports. "But that night I didn't." Less than two weeks later, McGary "dressed" for the Wolverines' Sweet 16 game against Tennessee. He was never going to play, but coach John Beilein thought the sight of him in maize and blue on the sideline, pumping up his teammates, would add some enthusiasm. Michigan eked out a 73-71 win. Amid the post-victory celebration, an NCAA representative told McGary that he, of all people, had been selected to undergo a random drug test, even though he hadn't played in months. A week later, after Michigan was knocked out of the tournament, McGary was contemplating whether to enter the NBA draft or return for his junior season. Coming back would allow him to prove his back was fine and continue enjoying life in Ann Arbor. His play could bolster his NBA draft stock. It was an attractive option. That's when he was called into a meeting with Beilein and athletic director Dave Brandon. They told him he failed the drug test during the NCAA tournament. Then they informed him of the NCAA's harsh penalty for a first failed test: a minimum one-year suspension from all competition. If he wanted to play college ball again, it wouldn't be until the 2015-16 season. "The penalty is a year," McGary said. No longer was there a debate about his future. McGary will enter the NBA draft by Sunday's deadline, he told Yahoo Sports. He's confident in his future, but says he didn't really have a choice. The NCAA penalty cemented the decision for him. "It's just with the NCAA and their strict rules, they don't show any mercy," McGary said. "They take their things seriously." Testing for recreational drugs in college athletic programs is wildly variable, borne of a policy unlike almost any other from the NCAA. It allows schools to set their own standards and merely demands they follow them. The NCAA will test year round for performance enhancers, but "stimulants and street drugs are generally not tested," the NCAA's own "Drug Testing Handbook" states. Some schools are more lenient. Some, such as Brigham Young, have zero tolerance. Michigan tends to fall on the stricter side, with widespread testing and serious consequences. McGary said he passed eight drug tests administered by Michigan over his two years in Ann Arbor, including five this year despite his limited play. "[That's why] this was a surprise," Beilein told Yahoo Sports on Thursday evening. "This is not Mitch McGary. Not the one I know." Had McGary failed a Michigan test, he would've been subject to Michigan's punishment for a first-time offender: a week away from all team activities and a suspension from 10 percent of the regular season, or in this case three games. A second offense is suspension for half a season and a third calls for permanent ineligibility at the school. During championship tournaments or bowl games, however, the NCAA takes over and now may test not just for PEDs, but all banned drugs classes, including recreational. The NCAA penalties are also harsher. By failing a test administered by the NCAA, rather than his school, McGary was subject to the draconian Bylaw 18.4.1.5.1, which calls for a player to be "in­eligible for a minimum of one calendar year." A second offense, even for just marijuana, results in permanent banishment. "If it had been a Michigan test, I would've been suspended three games and possibly thought about coming back," McGary said. "I don't have the greatest circumstances to leave right now [due to the injury]. I feel I'm ready, but this pushed it overboard. "I don't think the penalty fits the crime. I think one year is overdoing it a little bit." Michigan agreed, McGary said, and appealed the decision to the NCAA in early April. It was denied, however. Neither the university nor the NCAA would comment directly on the case or the appeal. The NCAA's denial became even more confusing when on April 15, just days after the appellate ruling, its legislative council agreed a full-season ban was too strong for a first-time recreational drug failure. It changed NCAA policy and lowered the penalty to half a season. "Street drugs are not performance-enhancing in nature, and this change will encourage schools to provide student-athletes the necessary rehabilitation," the NCAA said in a statement. Yet the NCAA declined to apply the new standard to McGary because he violated the rule under the old terms, even if it was just weeks prior to the change. Spokesperson Michelle Brutlag Hosick said the new policy does not actually go into effect until Aug. 1, the standard date for the NCAA legislation. This entire case feels like a stern and inflexible bureaucracy pushing a high profile, would-be All-American out of college competition for no particularly good reason. The NCAA couldn't reasonably expect a player of McGary's caliber to sit out a full season and thus delay a professional opportunity for two years. McGary said he isn't bitter because no matter the circumstances, he believes he's ready to be a NBA player. Still, this isn't the kind of thing he wanted factoring into his decision. The Chesterton, Ind., native could've just turned pro and not mentioned the failed drug test publicly or privately. It stands to reason other players have done just that. Instead, McGary believed being honest would be best for himself, his family, the Michigan program and his pro future, where he won't have to worry about news leaking out and NBA teams believing he was hiding something. "I'd rather come out and say I messed up," he said. While he doesn't agree with the length of the NCAA's punishment, he wants to be clear he isn't blaming anyone but himself. He sat across a table here Thursday seeking a chance to give an explanation, not an excuse. "I was just really stressed out," he said of the frustration of not being able to play. "I was at a bad point, just coming off back surgery. I just wasn't really thinking it through. I have definitely learned from it. "I am just disappointed in myself overall because this is not me, this is not who I am overall." He hopes he's remembered at Michigan as a player who gave everything to his team even when all he could do was root his teammates on from the sideline. "To all the Michigan fans out there, 'I'm sorry,' " he said. "I did not want to end it this way. Basically, I just messed up. But we have certain rules and regulations that we need to abide by and I slipped up and didn't abide by them. Things happen and you have to move on from them." Beilein said he still fully supports McGary. "Mitch admitted it immediately," Beilein said of confronting him with the positive test. "We preach integrity each day in this program and this is reflective of that, someone coming out and saying I used very poor judgment and I regret it and I want to move forward. I think a lot of people will forgive people who make youthful mistakes." McGary also hopes that by coming forward on his own he can turn a negative into some kind of positive to NBA general managers. He considered declaring for the draft after his freshman season, when many teams thought he could be a lottery pick. Now with the back surgery and this revelation, he isn't sure where he may go. "This was a learning moment for me," he said. "I think I'm a great person with good character that does the right thing most of the time." The case also shines light on the NCAA's uneven system for dealing with recreational drugs. Even with the lightening of the suspension to a half season, it remains a heavy penalty and creates periods of the year, as with championship tournaments, when sanctions arbitrarily increase. Beilein said the fear of the NCAA's one-year suspension is so significant it caused the program, which already tests relentlessly, to drug test the entire team prior to the Big Ten tournament. "Just to make sure, we make a conscious choice to test everyone," Beilein said. McGary, however, smoked between the Big Ten and NCAAs. During its tournament, the NCAA can test any player on a roster or in the team's traveling party – even players in street clothes not affecting the outcome of games. McGary may have worn a uniform for the Tennessee game, but it didn't matter. The NCAA can demand a school test an injured player who remains back on campus. With his NBA decision made, McGary planned on finishing a final academic paper by Friday before heading home to Indiana to begin preparing for the draft process. He said he appreciated all Michigan did for him in appealing the NCAA ruling, even if it didn't work. "The NCAA really doesn't show any mercy," he said. "Even if I was a good kid with good character. They don't really care about that. They don't care about the program, the university. If you tested positive, there are consequences." He wishes he didn't have to do this. He isn't looking forward to the story spreading. He isn't going to sink into a state of depression over it, though. He made a mistake. He says it's isolated. "I don't want people to think I'm overlooking this, because I'm not," he said. "But I'm a positive person. I messed up. There's nothing I can do about it. It's in my past now. I'm just going to try to learn from it."